BDX Connect is an affordable, efficient method for marketing to real estate agents in your area. Your powerful, custom-designed, email message is delivered to agents ready to do business with you. Target the agents that you want to reach by; zip, city, metro area or state. FREE turn-key email design templates to choose from or we can create a custom design for less than most advertising agencies. Home builders: want more local agents to sell your new homes and communities? Imagine the number of home buyers that agents in your local area are already working with at this very moment. Now imagine these agents promoting your new homes and communities to their buyer clients. The BDX Connect Program gives you the ability to effectively promote your homes to your local market’s real estate sales force. Get your quick delivery homes, available homes, new plans and community information into the hands of agents working with home buyers. Announce to agents that you would like them to bring their buyers to your new homes and communities. Keep interested agents up-to-date by promoting special incentives, quick delivery homes, community information and inventory. 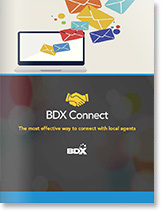 Email connect@thebdx.com and a BDX® Sales Representative will show you how easy it is to connect with agents in your area.